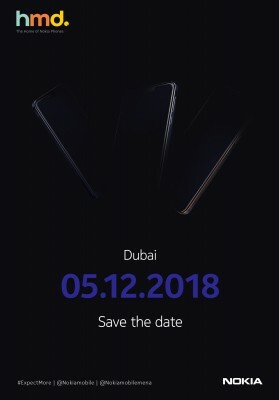 HMD has booked a stage in Dubai for December 5. This announcement comes with a shadowy image that shows three phones and the #ExpectMore tagline. Naturally, Chief Product Officer Juho Sarvikas gives no further clues which devices will be unveiled. Boosting the brightness of the image shows that the left and center phones have notches, the one on the right does not. A Nokia 8.1 is expected with a notch and the Nokia 7.1 Plus is still to make its way west (currently, it’s available as the X7 in China). There’s also a Nokia 2.1 Plus on the horizon (likely to sport a notch as well). There’s one hotly-anticipated Nokia without a notch in the rumor mill – the Nokia 9. CAD-based renders confirm earlier leaks that the screen will be a classic rounded rectangle. Given the timing of the event, however, we might not be so lucky. High-profile launches rarely happen in December as that would mean a market arrival too late for the holiday shopping spree. So we might get a local launch for some phones that we've already seen. Here's hoping we get more hints as the date approaches.